Making money for Charity. Why Morzine's community is epic!! Making money for Charity. Why Morzine’s community is so great! Morzine has a community which is slightly different to many other places in the world. Above is a quote we wrote in today’s release of our latest Facebook event : Peace & Dove present The Jungle Jam at L’Aubergade. The quote is about Morzine’s community spirit and why the town is just so amazing at supporting people less fortunate. Releasing this event promped us to look at how much money we have collectively raised at L’Aubergade & Mountain Mavericks for various charities over the past 365 days for various charities. Amazingly we found out the figure is just over €4000 since April 12th last year! This money has helped hundreds of people through distributing the fundraising to L’Auberge Des Migrants, The Cystic Fibrosis Trust, Snow-Camp and Protect Our Winters. Collectively we have also thrown events for a family made homeless by the 2015 Nepalease earthquake & a local house fire in Le Biot. In both cases this money went a huge way to helping the families when they needed it the most. What we just want to say is a MASSIVE thank you to everyone who has come to our events in the past and for Morzine’s locals & seasonaires for being so amazing! So THANK YOU everyone who has drank a toffee vodka shot for charity at our bar! Thank you all the bands that have let us donate their band fee to charity! Thank you for all of the charity raffle donations from local companies! 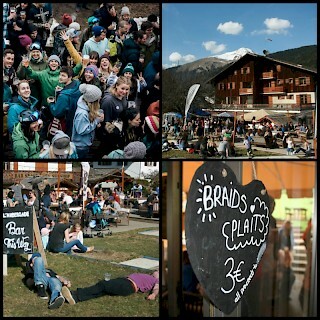 Thank you Morzine for getting involved in each and every event we’ve put on. From liking and sharing on Facebook to the people who have helped organise the events! We’ll keep the charity events going on if you keep making them so special! Special thanks go to Cab Collective, Snow-Camp, Luke Albro, Beckalina Stewart, Peace & Dove, Morzine Yoga, Cecile Burton, Planks Ski Clothing, Zuri Aura, Finest Hour Clothing, The Buskers, Morzine Source Magazine and all the local companies for helping us raise the game for charity fundraising and events in the alps! Previous: Win a holiday to the French Alps with Mountain Mavericks & Bear Nibbles! Next: Supported Alpine Cycling Tours. Check out Velovation!